The market was looking for a reading of 228 thousand. The industries of profession, business, information services and health care hired the most whereas the manufacturing sector was one of very few sectors that lost positions. The impact of a new low in unemployment is also good news for the stock market. 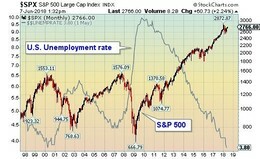 The U.S. Unemployment rate and the S&P 500 trend in opposite directions. As the chart indicates, these two key indexes have a tight contradictory movement. Bottom line: The steady decline in the U.S. Unemployment rate is promising news for the stock market. The main takeaway is that as long as unemployment remains low the stock market should continue to trend upward. 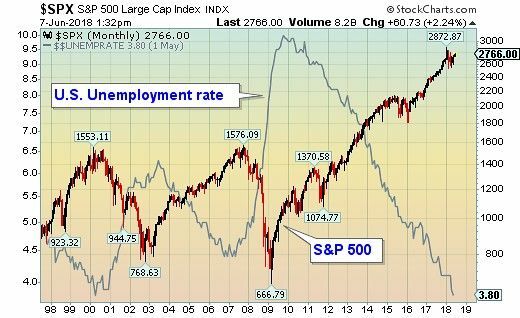 The transition towards rising unemployment is not immediately negative for the S&P 500. Patterns over the past 60 years have shown that the U.S. jobless rate normally bottoms-out for six to 12 months before starting to increase. This "grace period" allows for investors to have a pre-warning of a likely end to the business cycle and of a new downward trend in the stock market.